The twenty young adult flash fiction stories featured in this collection of twisted tales will creep inside your mind and stay with you long after you’ve finished the book. Author L. H. A brings a visual sensibility to twenty twisted stories about the blurring of boundaries between the realistic and the impossible. In one of the stories featured, a girl believes she is “defective” because she cannot speak. But she finds a mysterious notebook that will lead to a magical adventure and will reveal the truth about who she really is. 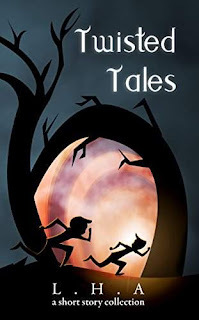 Other stories feature a boy mustering the courage to stand up to a bully, a man determined to change the world, a fairy who ends up hunted by humans, and an old man confined by a debilitating disease. Each of the twenty stories features not just a fantastical concept but a message that will resonate with readers of any age!